Ladies and gentlemen, for those eagerly watching the skies, there has been a slight change in plans. 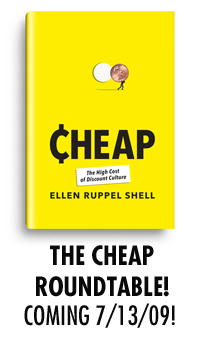 Due to unforeseen circumstances, we will be discussing Ellen Ruppel Shell’s Cheap: The High Cost of Discount Culture during the week of July 13th, not the previous week (as previously announced). Yes, this is a fundamentally simple piece of data. The equivalent of attending a math class, walking up to a chalkboard with an eraser, wiping out a number in an equation, and replacing it with another number. If you did this, it probably wouldn’t be that big of a deal. But since the discussion here does involve the Internet, shouldn’t it be more complicated than it needs to be? So for those who wish to follow along, you have another week to think about the book. We have also managed to coax a few more souls to jump into our roundtable fiesta.